Hardwood floors are a beautiful addition to any home. Their timeless and natural look has the power to brighten even the dullest of places. From white oak to Brazilian walnut hardwood floors offer a decent flooring choice for every taste and wallet. However, the species of hardwood isn’t the only thing to determine the appearance of the floor, the stain is just as important. Different wood species come with different natural characteristics. 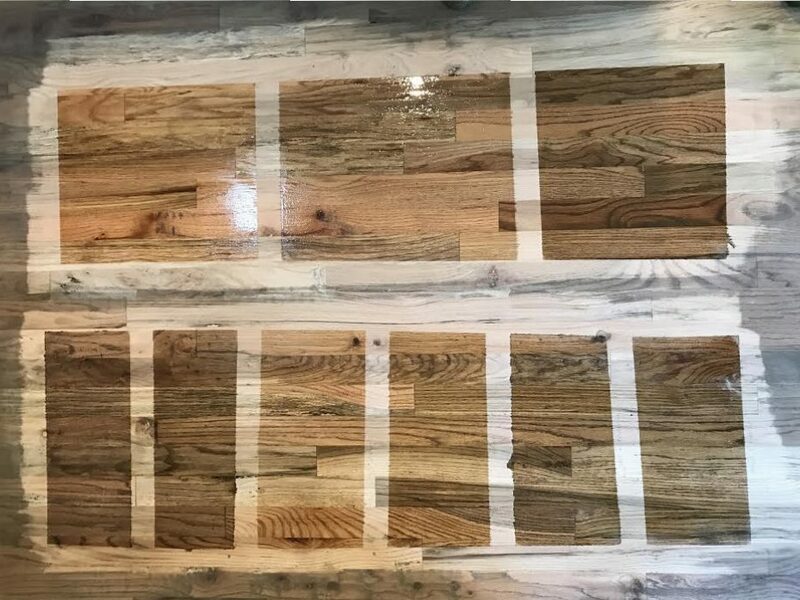 This doesn’t only determine their performance in a certain environment but also dictates how they absorb stain so that using the same stain on two different kinds of hardwood can lead to absolutely non-comparable results. The reason behind this is their contrasting hardness. Some harder woods are denser while others are more porous and soft. This makes it easier for the staining liquid to get into the pores. To avoid any color inconsistency it’s important to test your stain prior to application. This will give you the advantage of knowing exactly what the stain of your choice will look like on your species of wood. At GC Flooring Pros we test sample spots for our customers to find the perfect match. We only use high-quality wood stains. Some of the colors you may choose from are listed on the DuraSeal website. 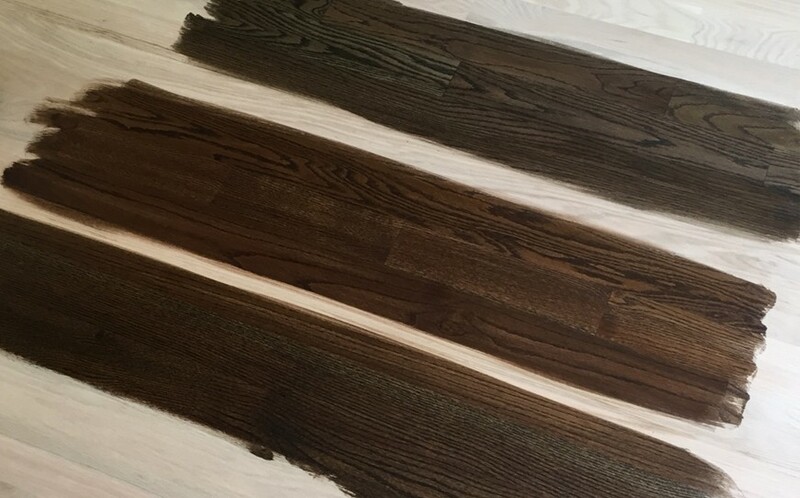 Doing a stain sample will help you get the stain color for your specific hardwood species just right without having to play the guessing game. A room is like an organism, it’s an amalgamation of different goods with different purposes that function as one. Ideally, nothing’s out of place and every detail is carefully thought through. The floor being one of the largest surfaces in a room can greatly affect the dynamics of the space. Wrong stain tone can not only clash with your décor but affect the quality of the time you spend in the room. But the right stain can tie the place together and make your stay more enjoyable. So before making a decision, consider how it will compliment everything else in the room including the wallpaper, furnishings as well as general style and accent colors. The most popular colors these days are Ebony, Antique Brown, Provincial, Dark Walnut, Medium Brown, Weathered oak and some combinations. If you’re going for a lighter color we suggest using white oak rather than red oak. To give your hardwood floor an even richer look we use polyurethane varnish. Keep in mind that the type of polyurethane can affect the color of the stain after application so there is even more reason to do a stain test first. As a general rule, oil based polyurethane tends to darken the wood a bit but it’s slightly better at resisting scratches, moisture and heat when compared with the water-based alternative. Then again, applying a water-based poly won’t lead to any changes in tone and will preserve the wood’s natural tone. You also have to choose a matte, satin, semi-gloss, or gloss polyurethane. Matte and satin are becoming more trendy, we are seeing that wood floor conglomerates do not want as much sheen these days. Even though choosing the right stain colors can be difficult, there is not much to worry about. With solid or even thicker engineered hardwood floors you can easily refinish them to give the flooring desired tone. A lighter stain can help make a dark room appear brighter and more spacious than it really is. If you have dark furniture, installing lighter hardwood with somewhat matching stain will create a beautiful contrast and help your decor stand out. By choosing a lighter stain, you won’t have to clean nearly as often as in the case with dark stained floors since dust is less visible on a lighter surface. However, light stains aren’t as good at hiding hardwood’s natural imperfections as its darker alternatives. If you aren’t one for dramatic changes this is the stain for you. While medium stain won’t really affect the overall colour scheme of the room, it will most certainly compliment many other wooden details in your decor and still help tie the room together. A medium stain is also a reasonable option if you haven’t decided on the look of the space yet and would like to keep as many options for wall & furniture colors open as possible. Dark stained floors are elegant and will help ground your bright room nicely. The balance between darker bottom and lighter top parts of the room will make the space more inviting and help the accent colors in your interior stand out more. A darker stain is superior for hiding hardwood’s natural flaws but it falls short when dealing with inflicted imperfections like scratches. Pet hair and dust aren’t easy to hide either. In a word, if you have a dog or a small child or expect above average wear because of any other reason it’d be a safer bet to go with lighter stain.